Prime Minister Harris smiles as the Rev. Adelyn Mgonela blesses the site as students from grades 5 and 6 of the Edgar T. Morris Primary School in Tabernacle look on. At the left of Prime Minister Harris are His Excellency George Chiou, ambassador of the Republic of China (Taiwan) to St. Kitts and Nevis, and Minister of Health et al. the Hon. Eugene Hamilton. The state-of-the-art EC$2.4 million health centre will provide a wide range of services such as treatment and management of HIV/AIDS, hypertension and noncommunicable diseases; environmental health services; mental health services; antenatal services, including those for normal and high-risk pregnancies; and child health services, including immunization. Ida Duinkerk (née Mercer), a 69-year-old Tabernacle resident who attended the ground-blessing ceremony with her husband, sat in a wheelchair on Thursday morning as she expressed excitement over the new health centre, whose building began Nov. 19, 2017. 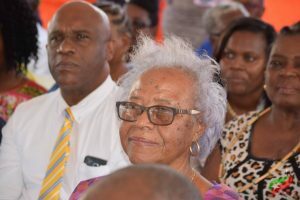 Duinkerk told the press unit in the Office of the Prime Minister that when it opens, she intends to go to the new health centre for her exercises. Susanna Lee of Tabernacle, who resides in Stone Castle, also attended Thursday morning’s ceremony. Lee’s illustrious 40-year-plus career in education – of which 26 years were spent serving as a principal – has been memorialized with the Susanna Lee High School Scholarship award administered by the Social Security Board. During the ground-blessing ceremony, she beamed, thinking about the many generations of children who would benefit from the opening of the health centre. 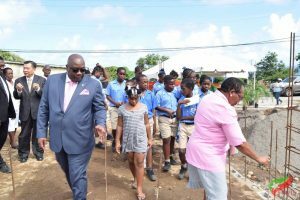 Several years ago under the previous administration, the Tabernacle Health Centre – facing extensive termite infestation and a crumbling physical and septic infrastructure – was relegated to the basement of the nearby day care centre, where it remains to this day. The new health centre is being constructed on the demolished site, which has undergone extensive subterranean soil treatment to kill the termites under it. William Challenger of Tabernacle, who is the proprietor of William & Son, won the competitive bid to construct the health centre in his community. The government of the Republic of China (Taiwan) contributed US$1 million dollars toward the construction of the Tabernacle Health Centre.